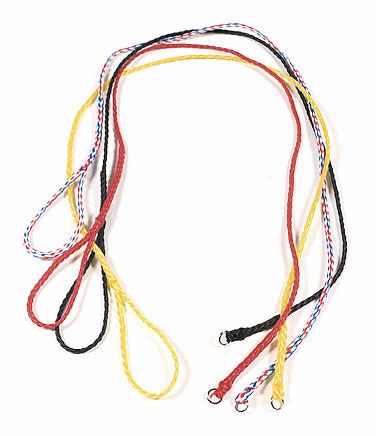 This leash is excellent for in-house use, or to give to those clients who forget to bring a leash. It is machine stitched at both ends for added security. Round 1/4" x 50" polypro "ski rope" with a solid nickel plated "O" ring. This leash is excellent for in-house use, or to give to those clients who forget to bring a leash. It is machine stitched at both ends for added security. The ski rope promotes safe transport and is still very economical. Available Colors include: Black, Blue, Red, Green, Yellow, and Red/White/Blue Combo. (You may combine colors in multiples of 50).